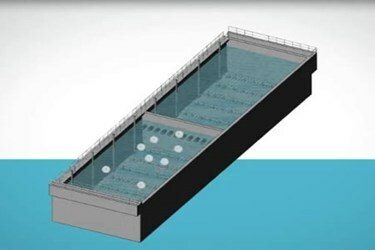 The Integrated Fixed-Film Activated Sludge (IFAS) process is typically installed as a retrofit solution for conventional activated sludge systems that are at or beyond capacity. Easily integrated into existing infrastructure, the video shows how IFAS combines the best of two processes: activated sludge and fixed film. During a fixed film treatment process, biocarriers move freely within a reactor supporting the growth of densely populated bacteria that achieve nitrification, denitrification, and phosphorus removal. It is this high-density treatment population that supports dramatic gains in volumetric productivity without increasing levels of mixed liquor suspended solids.